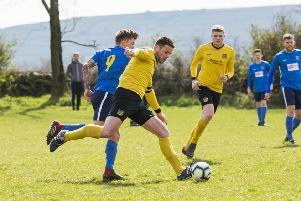 Ovenden WR’s march towards the West Riding CA Division One title continued with an 8-0 win over bottom of the table Bradford FC on Saturday. The game was switched to the all weather pitch at Thornton Leisure Centre due to waterlogging at Ovenden’s West Vale ground. Ovenden, without goal machine John Booth, made a sluggish start against opponents who belied their lowly league position and kept West Riding at bay for the opening 15 minutes. There were glaring misses and excellent goalkeeping by Ateek Hussein but once West Riding had made the breakthrough they scored at regular intervals through Damian Randall (2), Mat Jones (2), Hayden Kerris, Graeme Sides, Glyn Beale and Andrew Bailey. Matty Hirst pulled off some excellent saves late on to ensure a clean sheet.